The heart of SOUP is community engagement in a common cause. Often the little guys in the world with a great idea slip under the radar of grant funders, they may not be registered charities and they may not have networks to make things happen. SOUP gives those ideas a platform, a ready made audience and a little seed-corn funding. The idea is simple. At Downend SOUP we create an environment for people with an idea to meet people who want to see the world as a better place. We provide a means for them to meet, some simple food as this always helps get people talking, the audience listen to the ideas, donate some money on the door, vote for their favourite and the idea with the most votes gets all the donated funds to kick start their idea. It’s a form of investment from the community audience and all we ask is they come back at a future event to explain what they’ve done with that investment. SOUP is also ultra-local community action – it engages people to think about the way they can change the world around them and engages those living in communities to join the cause. It involves a little bit of effort but very low start-up costs and if you manage it, you’ll be joining over two hundred such projects that happen right across the world. My blog is the Downend SOUP blog but there are over 200 SOUP projects with the grand-daddy of them being Detroit SOUP who started this in 2011 and will always help you with questions, contacts and their experiences over time. Providers of food & drink and consumables such as cups, spoons etc. CAUSES: actually of everything we’ve had to do with SOUP this is the most tricky – some people are put off from presenting at SOUP because; the money isn’t big enough for them, they don’t like the idea of pitching in front of others, they don’t feel the concept suits their organisation, they don’t understand the concept. You may find professional paid fundraisers from established charities approach and how you deal with this is up to you – in our experience our audience are engaged with the concept of helping the under-dog. We know from feedback they’re interested in people who cannot get support from anywhere else and who are bringing benefit to the locality. Speak to your local volunteer CVS bureau, local councillors and build your pitchers from there. Leave plenty of time in our experience this bit is harder than it seems yet the quality and balance of causes is what engages your audience and brings them back again. VENUE: churches, community halls, school halls and even rooms above pubs – most communities have venues of some kind, normally they charge for hire so we’d suggest try your luck at asking organisations to forgo their usual hire fee as their “donation in kind” to this community endeavour. Most will respond positively in our experience if you explain things well and give them some credit. Some corporate organisations can help – if you’ve a business park or large corporate in your neighbourhood – they can be a bit trickier to deal with for security and opening hours. You will want your venue to be free. If you’re thinking of Junior SOUP – be thoughtful about one of these venues being owned by one of your pitching groups and how fair this may appear. PLATFORMS for Advertising and Selling tickets: again we look for things that are free as we want zero set up costs as far as possible. For tickets we use Eventbrite which is free and quite easy to use. Eventbrite markets your event for you amongst its user base and via social media. You can set different ticket types and know in advance how much you need to dial up or down your marketing to get an audience. For advertising in our neighbourhood we have lots of established facebook groups we post into but for a Junior SOUP event, leaflets in book bags, announcements in assemblies or newsletters can help spread the word. A website called CANVA is mostly free and can easily create professional looking posters in minutes so ditch Powerpoint – your audience will equate the quality of a poster with the quality of an event. Fortunately CANVA also resizes your creations for social media, posters or leaflets – it does a lot of the hard work. If you’ve a local newspaper or radio station, write a little press release with your idea – when you first get started you will have to work hard at this to get the concept across. Promoting your event we’ve never paid for Facebook posts – it may happen in the future but we’ve never had to. We post selectively into local neighbourhood group sites that we know have people interested in improving their community and we shamelessly ask them to share our posts. It’s not uncommon in some weeks for our posts to reach over 4000 people. Video can also help. For Junior SOUP you will inevitably find parents and grandparents tune in to the idea more readily but most residents will be sensitive to perceptions of young people so will connect with the concept of support children who are seeking to become positive contributing citizens. Don’t be shy and assume your audience will make the link though. FOOD and CONSUMABLES:Local businesses will likely readily support you with putting posters in their windows. But in our opinion businesses are much more important to your SOUP event. They have resources, networks, an investment in a community being a thriving and positive place to trade. Our suggestion would be track down local business associations in your area and ask if you can come and present your idea for the first SOUP. If you don’t have one then walk your high street but pick a time when businesses are not going to have to choose between listening to you and serving queues of customers. Make a list of the little things you want – paper cups, spoons, soup, bread, cake and ask if they can supply one thing on your list. Most businesses will be over-used to people asking for money and sponsorship and somewhat surprised to ask to donate something in-kind. It’s worth recognising it’s also a lot easier from pleasing their accountant to work in this way. In our experience they respond positively to a) someone who isn’t asking for money and b) someone who thinks about how what they need corresponds with the purpose of the business ie ask a café for soup, ask a bakery for bread. Be clear and confident in your message – a healthy thriving community is what every business needs. Do ask them to come to your event and consider giving them “sponsor” tickets to retain engagement. If you’re running a Junior SOUP be prepared for businesses to question why schools aren’t funding this themselves. Regardless of the reality of tight school budgets, try to shape your response around community impact and a shared purpose. ENTERTAINMENT: Not all SOUPs do this but at Downend SOUP we work really hard to ensure our audience have a great experience in just 90 minutes – that the event delivers value for them. Having entertainment also creates a helpful distraction at a key point in your running order, more on this later. But it’s also yet another way to draw people together to celebrate the talent in your neighbourhood. Give some thought to who can provide this and type of music that will please everyone. The less amplification and musical paraphernalia the better so your audience is not distracted by complex setting up and sound-checks. If you’re running a Junior SOUP consider finding an act that represents youth talent in your neighbourhood to reinforce the message but not one that is associated with one of your pitches as that might be seen as unfair. VOLUNTEERS. You’ll need two groups of these – people who will help with the logistics before the event and people who will help on the day. For Downend SOUP we have people pre-event who help with publicity, social media, a food co-ordinator, someone who likes talking to business sponsors and some SOUPs have a pitchers panel to choose who will pitch. Most pitchers are not professionals and having a volunteer who can coach in speaking skills can help pitchers and make for a better experience. If you’re running a Junior SOUP this will depend whether your school is running a lunch club or this is being done outside school. Your volunteer hours are likely to be higher as the children will need more support in researching and developing their idea, creating and practicing a presentation and you’ll have data protection and DBS considerations to factor in too. Volunteering in this sense is a little and often. On the night itself you’ll need people to arrange chairs, ways to serve the soup, people to take money on the door, an MC to host the event for your audience but generally these volunteers are happy to give a couple of hours, once every few months with no obligation. Your local scout or guide group may be pursuing a community badge and therefore happy to supply on the night volunteers. When we set up Downend SOUP we learned from colleagues in Torbay and Swindon and refined our approach for what we thought would work in our community. We thought carefully about start-time – too early and people would never escape Bristol’s traffic to get to us. Too late and people will be tired and thinking about their next busy day ahead. We went to one SOUP that lasted for three hours and considered that it was really too long so we run our event as a relatively tight ship 90 minutes duration. It is pacy and we design the running order to ensure there is never a lull where the audience become restless and everyone gets home in reasonable time. For a Junior SOUP you’ll need to balance this with the age of your presenters for whom being up on a stage at 8.30pm on a school night may not be the best. 8.50pm if you’re on your second event, this is a good time to reintroduce your previous winner so the audience understand what happened with their investment and reinforces the purpose of SOUP. If you have another event planned this is a good time to announce it and also tell people to spread the word on social media. If you do have another event and you’re using Eventbrite get this set up beforehand so that tickets are available at this point. You’ll find a lot of people will want to sign up immediately. 8.55pm the moment all are waiting for – the announcement of the winner – we allow a little time for them to say a few words before letting people get on their way with a lovely warm fuzzy feeling. And then the less glamorous job of tidying up your venue and you’re done! We structure Junior SOUP over two events six months apart and there are some big differences between a Junior and adult SOUP. For adult SOUPs the concept is winner takes all. For Junior SOUP we work this differently so that we encourage the children to pursue their ideas regardless. The way we do this, and you may see this differently, is at event 1 the audience votes count as “points” – 1 point for every vote. The children then go away and work on bringing their ideas to life and when they return at the second event the audience vote again on execution of the idea and each vote counts as 2 points. The “winner” is the team with most points who will win a Junior SOUP cup. But in the process, three perfectly valid ideas have still been brought to life. Money – for adult SOUPs at the end of the night we hand out everything that is donated on the door down to the last penny, people seem to appreciate this transparency. It does make us work hard to ensure all our input costs are covered by donations in kind but it is an easy simple message and avoids bank accounts. For Junior SOUPs we have to work this a little differently. We have three sources of funding with the aim of creating a prize fund that the children can draw down on to bring their ideas to life. We don’t use the “winner takes all” principle. Our three sources of funding were – a small grant from our parish council, the door money on the night and a “lender of last resort” offer from a local charitable trust in case our door receipts were too low. We aimed for a prize fund that could allow all three groups to drawdown up to £200 each. We didn’t need to call in help from our “lender of last resort” but we’re very grateful they stood behind us. Between the two events for Junior SOUP, the children can request funding from the SOUP fund. As we are a church-backed project, our church accountant has kindly agreed to look after this money and keep the necessary records. Any funds not drawn down will be given away at our next adult SOUP event so we can return back to our simply principles. Since we started Downend SOUP we have directly helped to create a support group for mothers suffering pre and post-natal depression, a job club for the long term unemployed and a nutrition and exercise programme for kids living in inner city tower blocks. 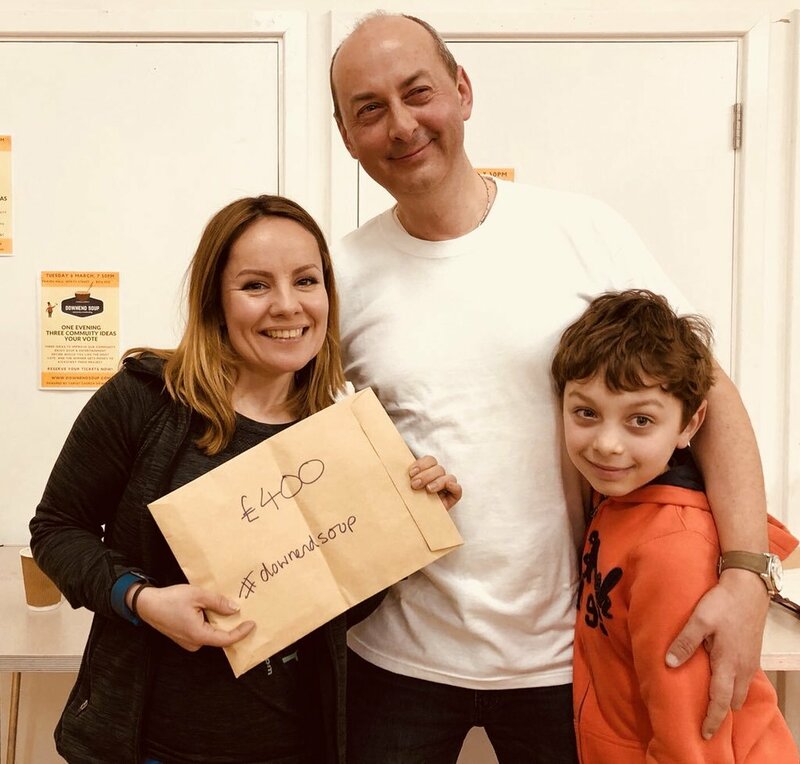 Even those who didn’t win at SOUP were helped by members of the audience with donations, networks and additional volunteers. Everyone has got something through their SOUP experience not least of which an appreciation and higher regard for the efforts of all these unsung community heroes. For Junior SOUP we have thirty children curious and passionate to be social entrepreneurs, using skills they are learning as part of KS2 curriculum to research, evaluate, consider, use judgement, work as part of a team and develop the courage to stand on a stage in front of an audience of over a hundred adults to state their beliefs and what they want to see happen. We are to our knowledge the first SOUP project in the world to branch out into developing the next generation of social entrepreneurs. Hopefully by reading this blog you’re not daunted – it does take some effort but the rewards for your community are so profound in our opinion it’s worth it.